We had a lovely weekend getaway to visit some dear friends in Benton Harbor, MI. I can’t get over how beautiful it is over there, just across the lake! In the short amount of time we were there we were able to take a few country drives and visit some lovely little farms and orchards, spend a beautiful evening at the beach to celebrate a 1st birthday, watch a gorgeous sunset, take a few spins on the best carousel I’ve ever seen, buy 5 pounds of blueberries, pick 8 pounds of peaches AND Stella got to go on a pony ride. And, of course, spend some quality time with our friends that we so rarely get see these days. It couldn’t have been more perfect! For the most part my phone was generally out of juice so I didn’t get to take many pictures. I’m sad I didn’t get any of the beach party. It was truly a beautiful evening. Luckily I had just charged my phone before we headed out on our first search for a blueberry patch. 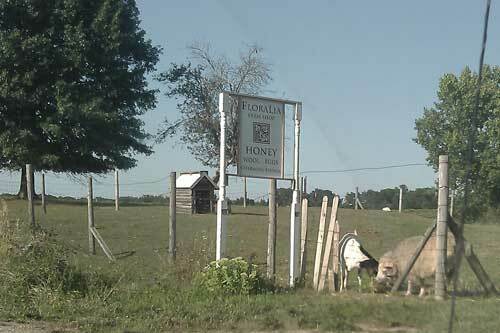 We didn’t find a patch but we did come across the cutest and sweetest little farm that I’ve ever seen, Floralia. After traveling down some country roads Bill and Jessica pulled over next to someone’s driveway, no parking lot or anything like that. This was literally someone’s home where they had decided to build a small off-road shop to sell their honey. Honey is their primary “business” but they had an assortment of the cutest animals I’ve seen assembled. 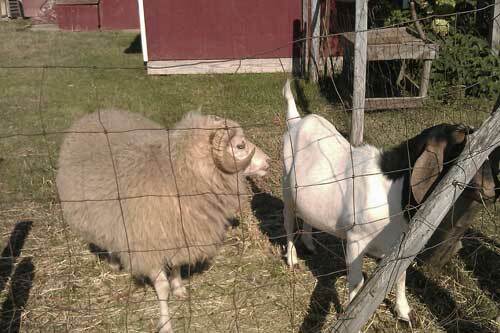 We were greeted by an Icelandic Ram and a cute and friendly goat. We gave them some pets and Stella gave them some grass then we moved on to say hello to the donkey who was looking lonely. The donkey turned out to be very shy and kept just out of petting reach for me, but later I noticed that Stella was making some progress with him. 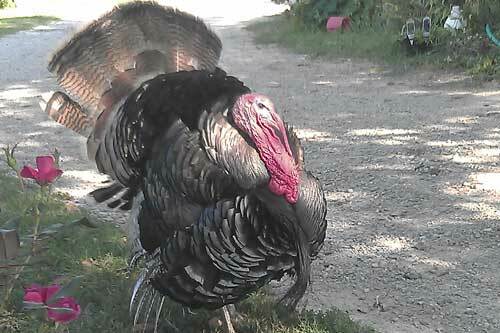 While we were fussing and fawning over these pretties the most beautiful turkey made his way over to us. Jessica said she thought he was a wild turkey that they kept at this little farm but she didn’t really know much about any of it since the owners had never been around when she stopped by to get their honey. It’s pretty normal for stands to just have their produce out with a little box were you put your cash, no human interaction necessary. 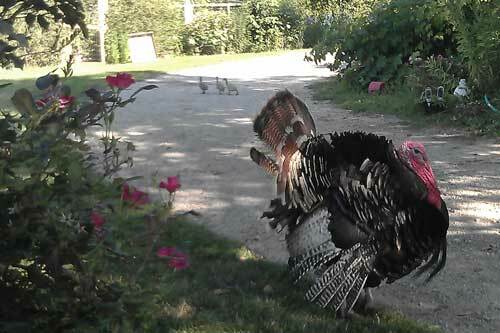 Since no one was certain of the intentions of the turkey, we kept a distance but couldn’t help to snap a few pictures of him. He was all puffed up and really showing off. We didn’t know if that was a sign of aggression and we didn’t want to find out! He continued to hover around us as we continued to admire the beauty of this little farm. It had such a natural organic feel to it. The way everything was placed. The location of the flowers and bushes. The bees were kept somewhat hidden further up into the property but we didn’t want to trespass so we just stayed by the pens that held the donkey, ram and goat. There was also a small rabbit cage that held 1 beautiful white angora rabbit and one more normal looking chinchilla rabbit. 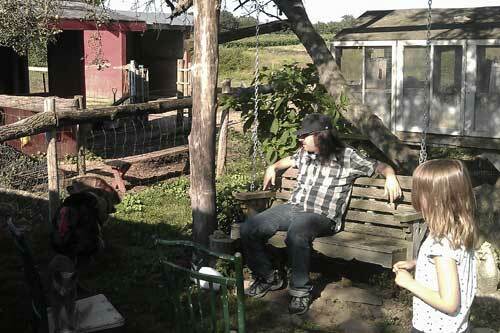 Jim sat on the swing and Stella communed with the donkey. 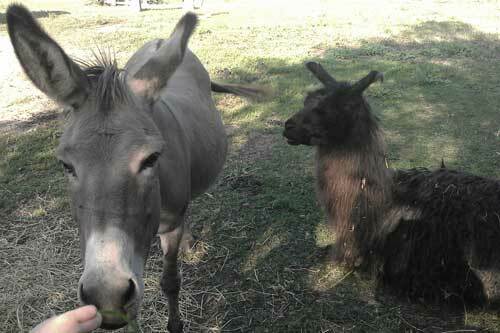 A scruffy black llama came over to say hello as well. Bill and Jessica told us about a documentary currently on Netflix called “My Life As A Turkey” and as they explained to me how intelligent these misunderstood birds were I could hear some motion coming from towards the house. To our delight the owner came out to chat with us. She was just as lovely as her property and was happy to answer our questions about each of the animals. It turns out that the turkey is a heritage breed and not actually a wild turkey. She explained that he’s incredibly friendly and loves attention. She encouraged us to pet him and we happily obliged. It was amazing to be so close to him. I admired his iridescent feathers and I had never noticed his beard until I actually got to pet him. She said he loved to go on walks and if they happened to go off without him he would run after them, noticeably upset for being left out. 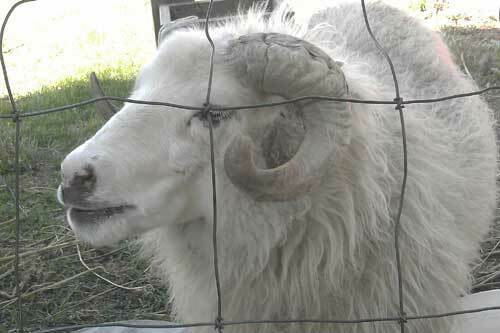 As we chatted with her Jim noticed the cat, who’d been quietly hanging around, dart off into one of the enclosures. Soon she emerged with a small squirrel and off she went with him. I was a little worried about Stella seeing to much of nature in action but she watched for a bit then turned her attentions back to the donkey. Before we left she gathered a handful of turkey feathers to take back with us. Not wanting to impose too much we decided to head out, we needed to get to the beach to set up for the birthday party anyway. It was really just so inspiring seeing this little farm and talking with the owner. The next day we drove through the country side to resume our search for a blueberry patch. Unfortunately, the blueberries had ripened early this year and most had already been picked so we just stopped at one of the many fruit stands and I “picked” up a 5 pound box. 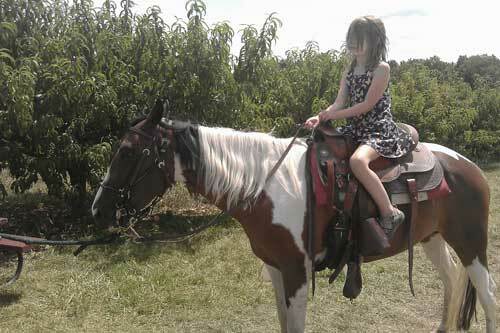 We decided to go check out a local peach orchard as well, since we had time and rumor had it that there might be horses in the area. The orchard we went to was quiet an operation. Huge! They offered multiple varieties of peaches, apples, cherries and apricots. We just wanted peaches. So you sign up, get a permit, then drive over some hills out to the orchard. Much to Stella’s delight there was one pony offering pony rides. Before anything else could happen Stella had to get on that horse. The woman who guided the horse was another lovely soul who enjoyed telling Stella all about her other ponies and how she had one horse that was 33 and she said when that one passed on she wasn’t going to get any more, but before he passed on someone brought her another horse and that’s how she ended up with Sparkle, the horse Stella was riding. Isn’t life funny! A mom at my daughter’s school had offered to pass on a hard to find container from the 1st grade supplies list so I jumped at that opportunity! Little did I know that by doing so I was also going to be getting a little intro to backyard chickens! 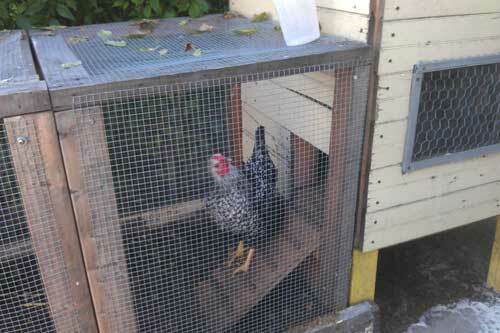 When I responded to the email for the offer of the container she said she could either bring the container to registration day or I could stop by her home and say hello to her chickens. Uh, hello! I knew Stella wouldn’t want me to pass up a chicken opportunity like that so I arranged to meet Kim at her home. Now, I’ve had the idea of getting chickens in the back of my mind for a while, Stella and I have talked about it and of course she’s all for the idea. But despite romantic notions I’m still on the fence about it. It kinda seems appealing, kinda not so appealing. It seems like a lot of responsibility since there’s the whole working full-time, have a kid, a dog and 2 cats thing going on already in my life with the newly added home remodeling thing on top of that, I’m not feeling like I’m in a big rush to run out and buy some little chickadees. However, I have to say after talking with Kim and seeing her set up it really seemed like the best idea EVER! First, let’s talk about the chicken coop. She built it from scrap materials from the building that was being rehabbed next door to her. She had to buy the chicken wire (and maybe the screws, unless she’s like me and has boxes of them laying around) and the rest was creative re-use. That’s pretty awesome. Of course, if you’re not handy there’s always Williams-Sonoma for a pricey backup. Well, they do have a lovely page dedicated to chickens, don’t they? But really, chickens aren’t as expensive as I thought they were. Kim bought her chickens from Belmont Feed and Seed and apparently the cost was extremely minimal…like, Stella could afford it herself (but don’t tell her that!). Of course they lay eggs and if you eventually decide that you want to cook your chicken there are plenty of butchers in the Chicago area that will do the job for you for less than the cost of buying a boneless/skinless chicken breast at Whole Foods. Then there’s the sustainability of it all. She has a 50 pound bag of feed but she also gives the chickens food scraps and lets them roam a bit in her small backyard. The flooring in their coop is all compostable and they scratch and turn it over and basically it’s a very sustainable composting machine that Kim then uses on her garden. I mean, to me that was a real eye opener that I didn’t know about. 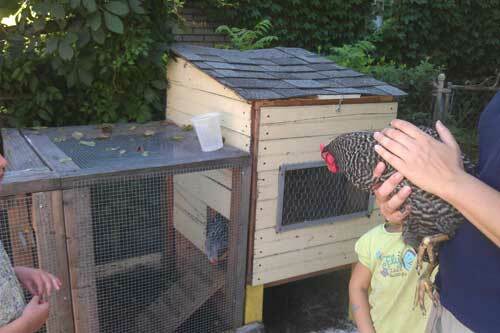 That chickens are like living composters, I thought that was pretty cool. I left thinking, “Wow, I had no idea that owning chickens was so inexpensive and sustainable!” I’m still not ready to dive into it but maybe next summer it’s something I’ll give a bit more thought to. The new checkered pantry floor. I guess my cat thought I didn’t have enough on my to-do list so she decided to add some emergency work to it. I started a few days ago when I noticed she had peed in the pantry. With a heavy sigh I quickly cleaned it up, but I had a feeling it wouldn’t be the end of it. And no, it wasn’t. My cat, Rocket, found the Achilles heel of the pantry floor and totally exploited it. It was badly tiled linoleum that had started to crack apart and she peed on it a few times (i’m guessing) so it seeped under those cracks and of course it smelled pretty, pretty B.A.D! Since Friday is one of our long days where we get home fairly late, I wasn’t in much of a mood to deal with this. But I started to peel up the cracked tiles and was pretty depressed to see that the wetness went further than I had the energy to dig up at that moment. I tried to sop it up as well as I could and I put baking soda on it with hopes that it would absorb the smell then left it to be dealt with in the morning, I am a morning person and starting a project at night is just not for me. So, the next morning I awoke, drank a few cups of coffee and got to it. Luckily, our pantry isn’t very large so I managed to peel and scrape the tiles within about 40 minutes. The glue that was holding it all down seemed to smell just as bad as the cat urine. I’m fairly sensitive to all these chemical smells so it was all a big bummer for me. There are layers of tiles on this floor. There is still a layer that I’m leaving for now. I’m hoping that in the future we will be able to re-do this whole area of the house but I really did not want to do all of that in one day. I think that even the subfloor may need to go when that day comes, thanks to Rocket, but for now I believe I have managed to eliminate the urine odor. Next I needed to go get the linoleum to redo the floor. 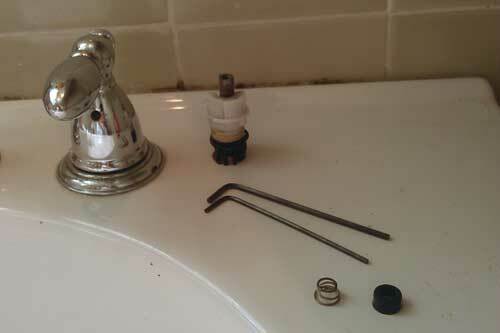 Since I had to run to the hardware store I decided to see if they had the parts I needed to also fix our badly leaking bathroom sink. The cold water was leaking so much that we had to actually turn off the main line for it, luckily it’s very easy to reach under our pedestal sink, even Stella could turn it on or off this way (though she’d often forget to turn it off once she turned it on). I had to go to 2 stores to find all the things I needed for these 2 projects. One store had the sink supplies, the other had the linoleum. I’m not sure what the final cost came to (I bought some extra stuff that I returned after I was sure I didn’t need them) but it was certainly under $40! 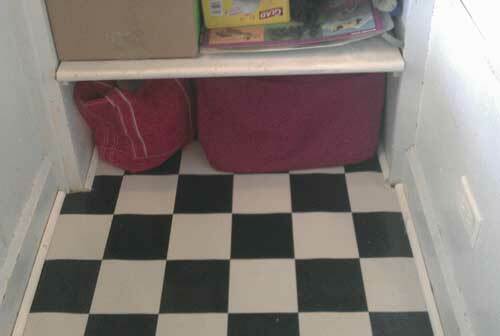 I was able to find a roll of black and white checkered linoleum for about $22. It was so easy to work with! I rolled it out on the deck and cut the shape of the pantry floor out with a utility knife. The pantry is approx. 61″x35″, so it was super easy to cut one big piece then fit it to the space. I decided not to glue it down since I’m not considering this a permanent solution and I’m waiting to see if Rocket pee’s in there again. I did also buy some cat repellent spray that I sprayed in there after the job was done. I was hoping to use the pantry to feed the cats since it has a doorway that I put a gate on to keep our dog, Klaus, out but now that this is happening I’m trying to find another area. It’s all very frustrating, to say the least. As for the sink, I can’t believe what a success that project was! I can’t say it was easy, and I was pretty stressed out the entire time I worked on it, but I took it slow and watched a helpful video on youtube and just kept trying until I got it right. It took about an hour and I felt pretty skeptical the entire time. It felt overwhelming and it seemed that there were so many things that could be the issue. While at the store I had an associate help me find the part I needed and right from the get go things were not looking good. None of the parts they had looked like the part I needed and really the associate didn’t seem to know any more than I did so to be on the safe side I bought 3 different pieces. Good thing I did because of course what seemed to be labeled to be the correct part I felt in my gut was wrong so I used the one that to me most closely resembled the part I was replacing and once I replaced everything it stopped the leaking. We now have a normally functioning sink. Cold water can easily be turned on and off. We are very happy!